Call Van Mall R.V. Park today at (888) 941-9335 or (360) 891-1091 to check availability or make a reservation for your R.V. trip to the beautiful Vancouver, WA area! A Van Mall RV Park staff member will be happy to assist you in planning your next trip. We feature stays as low as $35.00 a night, and we offer Good Sam Club™ discounts. We are also a Mobile RV'ing Preferred Property. 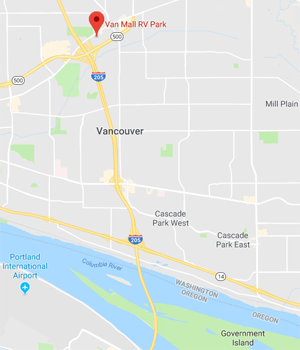 We are just minutes away from the PDX Airport, and we are close to I-205, and SR-500 to make travel to our RV park even easier for you. We look forward to seeing you at Van Mall RV soon!